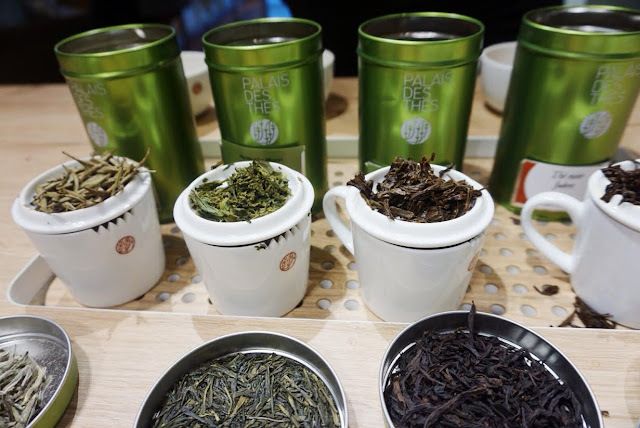 I recently had the pleasure of attending a tasting of 'Grand Cru' teas at Palais Des Thés SoHo. I felt fortunate to have the opportunity to relax, sip, and chat about everything tea. 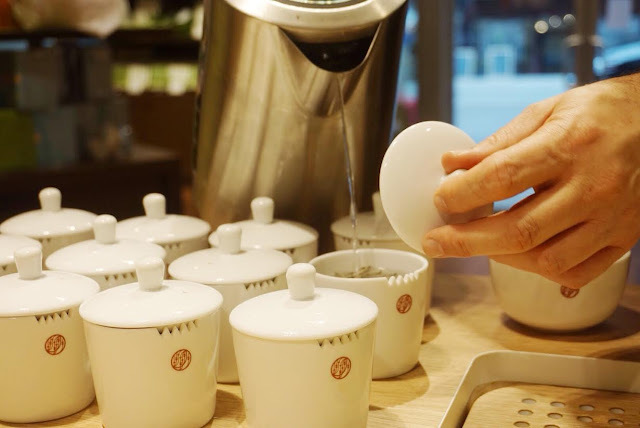 In the early evening the store is quiet and calm, with just the hiss of the electric kettle and clink of teaware to be heard. After a busy day of noise and emotions this was a most welcome respite. The gentleman running the tasting was knowledgeable, but also laid back and cheerful. I was amazed at how creative and spot-on his tasting notes were. We tasted four 'Grand Cru' seasonal teas that are fresh and dynamic. These teas are considered 'the best' and have a price to match. The quality of these teas certainly help justify the price. We started with Aiguilles d'Argent, a silver needles white tea. This tea needs a longer steep than the rest, brewing for 8-10 minutes at 160 degrees. This tea is comprised of just buds tasted delicate and sweet. It had a clean musky flavor with notes of chestnuts and honey. Subtle, and clean. 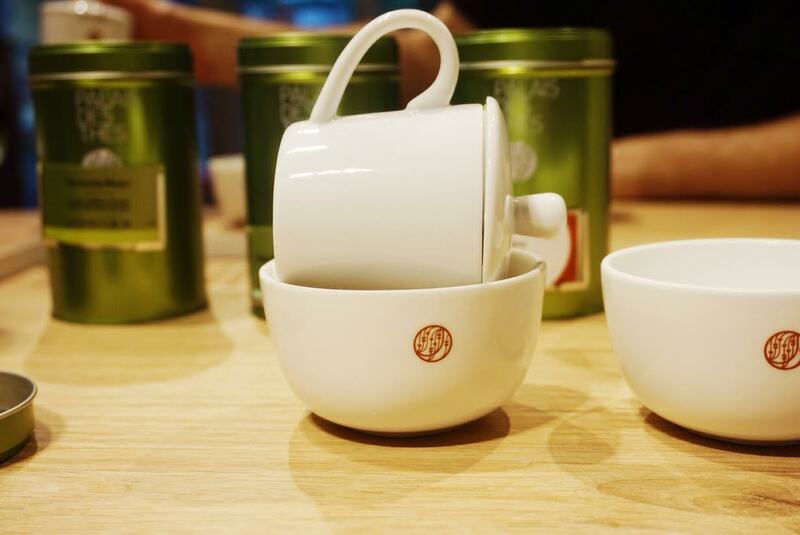 Many people think white teas are low in caffeine because of the subtle flavor and light appearance. However, this is incorrect. The buds have much more caffeine than the leaves, so keep that in mind if you are looking for something 'light'. Our next tea was Ryokucha Midori, a Japanese sencha. If you could bottle up the fresh sea air and steep it into a tea, this would be the result. A cooked spinach and seaweed flavor that feels very full on the palate. There was a slight bitter finish that I enjoyed, which played off the vegetal, salty flavors. I could almost feel the sand between my toes as I sipped the briny tea. I love that this tea means 'tea of the Samurai', as it was originally reserved for the Japanese Samurais. It certainly gives it a more 'grand cru' feel. This tea should be steeped at 130 degrees, for 1-3 minutes. The next tea was Feng Huang Dan Cong Special. (Special Phoenix oolong tea) The leaves are long and twisted like dragon tails. I imagine a bowl full of dragon tails steeping into a magic potion. This tea would be a lovely pick for the upcoming autumn weather. It is a little bit woodsy, a bit spicy, floral and sweet. There is also a nice hint of citrus. It matches well with cool weather, crunchy technicolor leaves, and picking fresh apples. This tea is from older and bigger leaves, so the caffeine content is a bit lower. It should be brewed at 195 degrees for 4-6 minutes. The final tea was my most favorite, and staggeringly expensive. Jukro, a Korean black tea is entirely plucked and processed by hand. The bold, strong flavor of cocoa was an amazing sensation. Rich, a little sweet, a bit acidic. The pleasant subtle sweetness helps bring this to more of a chocolaty baked good or chocolate bar flavor, and not to bitter cacao nib territory. This tea is more of an investment than most, at $37 for an ounce. All of these teas are quite expensive, but as I always like to point out, you still get a good value per cup. 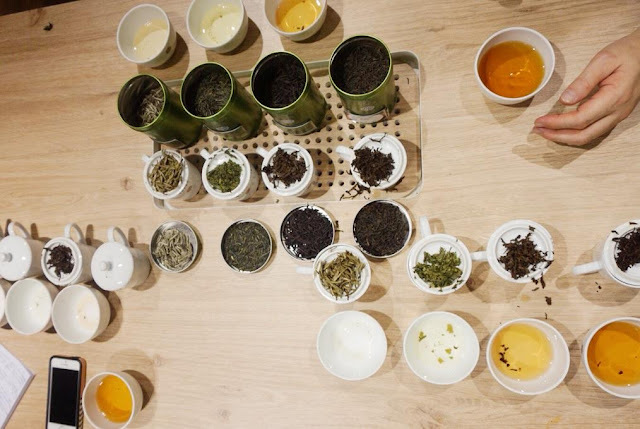 These teas can also be steeped multiple times, which also helps to bring the cost down. The 'grand cru' designation is completely one created by Palais Des Thes, but they are are still high quality teas. 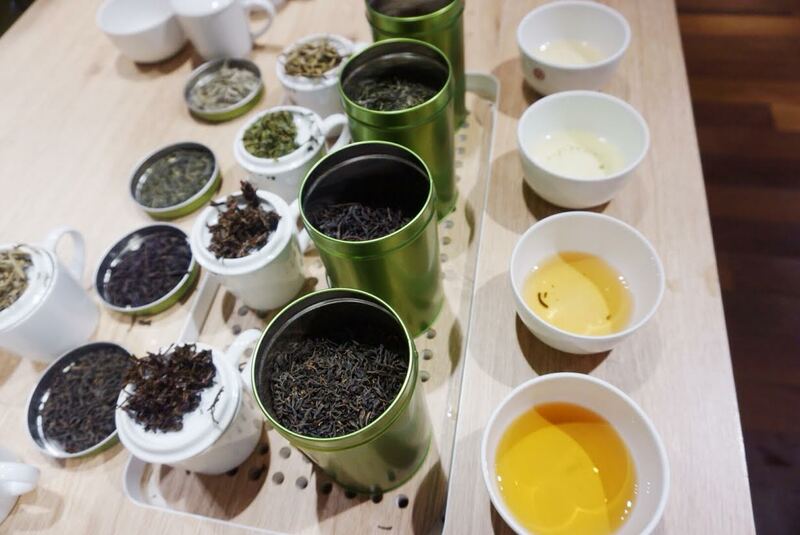 I was definitely buzzing and a little tea drunk by the end of the flavorful flight of teas. Thank you to Palais Des Thés for this unique opportunity!